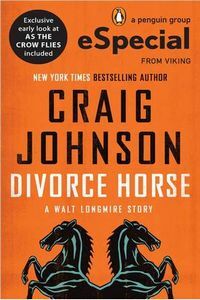 Divorce Horse by Craig Johnson: Synopsis and Online Purchase Options. Synopsis (from the publisher): Walt Longmire, the longtime sheriff of Absaroka County, Wyoming, has little time to relax. Still recovering from his manhunt chasing down escaped convict and sociopath Reynaud Shade in the Bighorn Mountains, Walt just can't find the opportunity to sit back and kick off his cowboy boots. His daughter, Cady, is getting married in a few months to the brother of his under-sheriff Victoria Moretti and is in town, helping her dad "recuperate" and to talk about love, life, and weddings. Meanwhile, the American Indian Days Parade and Pow Wow are attracting tourists and trouble. The pride and joy of Tommy Jefferson's stables—and the catalyst for his marital problems—the notorious divorce horse, has gone missing, and Jefferson, renowned Indian Relay Racer and one-time meth head, wants him back. With the help of his best friend Henry Standing Bear and his daughter, The Greatest Legal Mind Of Our Time, Walt sets off to the races.